Identify the general characteristics of real western red cedar (WRC) related to appearance, durability, versatility, grades, and finishes. Investigate ways to incorporate WRC siding and trim products on the exterior of commercial buildings for appearance and performance. Assess the use of WRC for specific interior finish applications on ceilings and walls. Explore the ways that WRC can be used for renovation and retrofit applications to create an updated appearance, improve durability, and contribute to the sustainability of existing buildings. Wood is a natural, renewable, and sustainable building material that has garnered more attention in building designs. While there are many species of wood available to choose from, western red cedar (WRC) has been a preferred and appealing choice for many buildings over the past 150 years for a lot of good reasons related to design, construction, and maintenance. WRC products come from trees grown in forests in the Pacific Northwest area of North America, but they are used in buildings around the world because of their warm, natural, aesthetic appeal and well-known durability and stability. While its use has been growing, many think of it only for residential (single-family) design. The fact is that, in recent years, WRC has become notably more popular in nonresidential buildings too. The types of buildings that architects are selecting it for include well-designed multifamily buildings, commercial structures, retail settings, hospitality and resort facilities, museums, churches, educational facilities, and most other project types where beauty and durability are sought. This course will look at some of the more diverse and innovative uses of cedar across this broad set of building types. 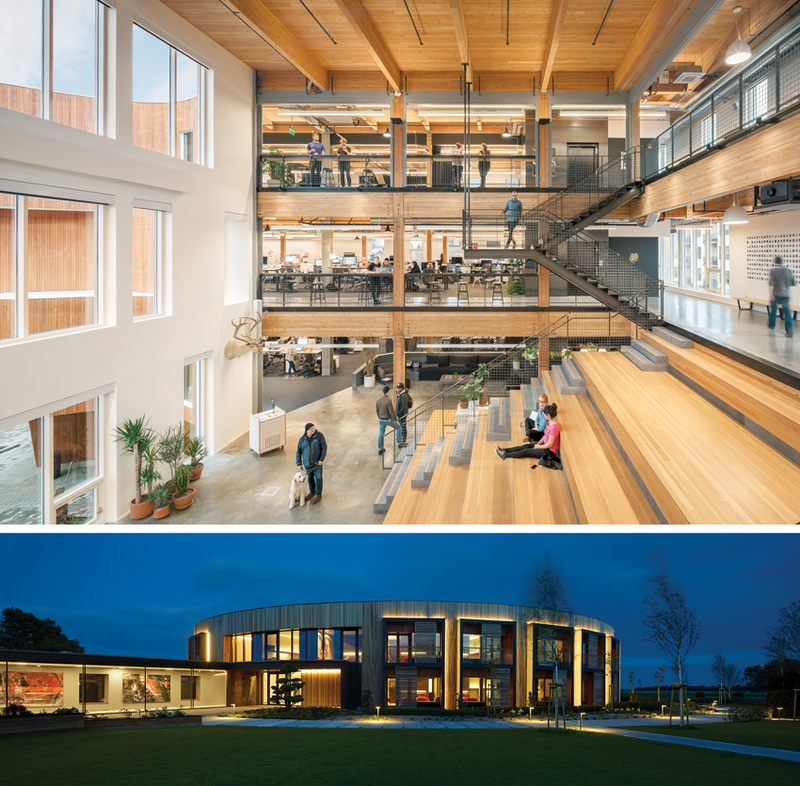 Western red cedar (WRC) is seeing a surge in popularity for exterior and interior use in commercial, institutional, and multifamily buildings across the United States and Canada. 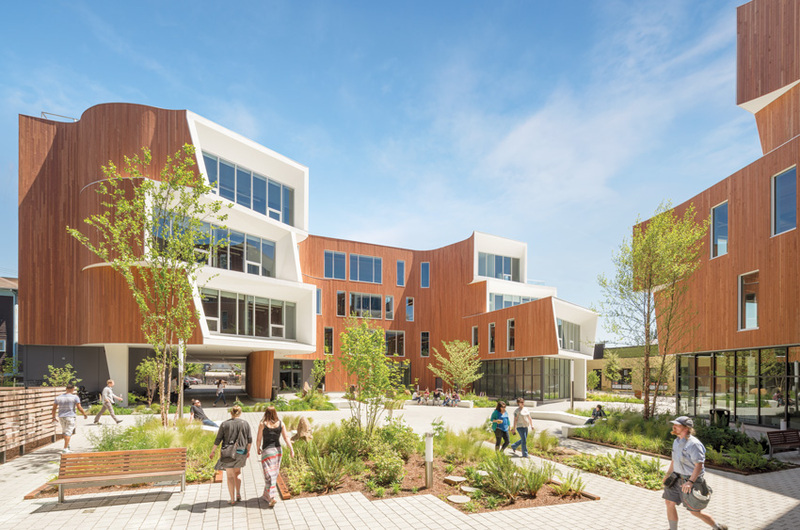 Shown here is One North, a mixed-use project in the heart of Portland designed by Holst Architecture. Appearance: WRC is real wood with the corresponding authentic appearance of wood. Its grain and natural color have helped it to become Cedar Siding Attributes regarded as a superior aesthetic imbued with decidedly crisp yet superbly rich tonal properties. It is quite attractive in a variety of commercial and other building types in a range of design styles, including traditional, contemporary, arts and crafts, and modern styles. Durability: WRC is well known for its longevity and durability due to the natural makeup of the wood. It has been found to be naturally resistant to rot, decay, and insect attacks, which means anything built with it will last longer and require less maintenance. Sustainability: Independent studies prove that when it comes to environmental performance, natural wood is superior to synthetic products in every way. While other building materials generate greenhouse gases, WRC trees actually remove greenhouse gases from the atmosphere. Further, unlike many manufactured or composite material, WRC is fully biodegradable at the end of its useful life. Perhaps one of the best-known sustainability attributes of WRC is that it is a renewable resource when harvested and replanted using sustainable forest practices. In fact, WRC in North America is sourced from some of the most sustainably managed forests in the world. These forests are managed by private companies who participate in sustainability certifications such as the Sustainable Forestry Initiative (SFI), Forest Stewardship Council (FSC), and Canadian Standards Association (CSA). The LEED rating system for green buildings now recognizes all three of these certifications. Versatility: WRC offers a wide range of sizes, surface textures, grades, and profiles—both standard and custom. Therefore it is easy to incorporate into a wide range of design schemes and patterns. Profiles: A virtually unlimited variety of common and specialty profiles of cedar siding, boards, and trim are made to suit different design and construction needs. These include beveled, lapped, tongue and groove, and boards for board and batten applications in various thicknesses and profiles for vertical and horizontal siding, paneling, and trim board applications. Grades: Recognized independent agencies use grading systems to identify different appearance lumber grades as distinct from structural lumber grades for cedar. These grading systems use terms like “clear vertical grain heart,” “A,” “B,” “rustic,” “select knotty,” and “architect knotty,” among others. The word “heart” in the case of grading cedar refers to the inner wood in a tree as opposed to the narrow outer sapwood between the heartwood and the bark. Surface texture: The surfaces of cedar products are available with a smooth surface, a rough-sawn appearance, or a rougher headed texture, any of which can be specified to suit different project needs. Fasteners: High-quality, corrosion-resistant fasteners that prevent staining and discoloration (i.e., stainless steel, aluminum, hot-dipped galvanized) help to assure that both the appearance and the performance are maintained over time. Finish: Unlike some other wood species, WRC is pitch and resin free. This means it’s ideal for accepting and holding a wide range of wood finishes, including clear stains, semi-transparent stains, solid stains, or paint to protect and preserve appearance and meet a variety of design needs for tonal properties or finished appearances. In all, WRC is a building material that contributes to dramatic or sublime design schemes, is readily and easily workable on a construction site, and holds up extremely well over time. With these attributes in mind, we will focus next on some specific ways that it is being incorporated into different building types around the United States and Canada to achieve excellence in design and construction. WRC is a versatile material for use on the interior and exterior of a wide range of building designs.